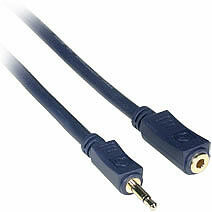 Extend the distance of your existing 3.5mm audio cables. Velocity™ 3.5mm Stereo Audio Extension Cables are specifically designed to provide quality music transfer from quality audio applications. 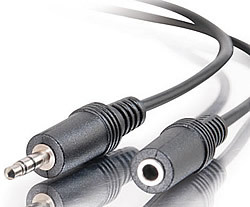 The 3.5mm cable lets you connect a PC sound card, portable CD player, MP3 player, iPod®, or any mini-stereo audio device with 3.5mm jacks to your other audio devices. These cables feature two 27-gauge Oxygen Free Copper conductors, a drain wire, an Aluminum Foil Shield to reject noise, and Gold plated connectors to ensure a quality connection. 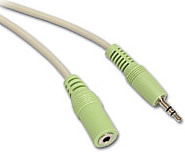 Use these cables to extend the distance between stereo audio devices using the 3.5mm connection, such as CD players, stereos, speakers, PC/TV tuners and other audio devices. The cable's shielded design and molded connectors will provide lasting quality and excellent performance no matter the connection.